Children in Year 4 take their learning very seriously and we strive to ensure that we live out our Mission Statement to the best of our ability every day. We usually have English and Mathematics lessons in the morning and cover History, Geography, RE, PE, Art, Music, DT, Computing and PSHE in the afternoon. In addition to regular participation at Mass, children are given the opportunity to conduct and lead their own prayer services for our class. Our altar is the focal point of our classroom, dressed in accordance to the colours of the liturgical calendar. 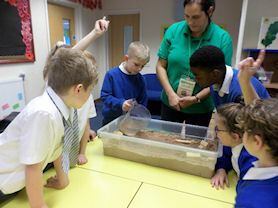 To enhance the Year 5 curriculum, the children can look forward to several trips throughout the year. 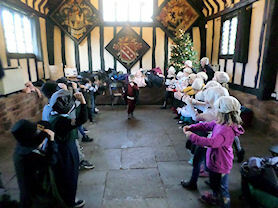 This year, the children will be visiting Birmingham Museum and Art Gallery and taking part in the Tolkein Trail at Sarehole Mill. 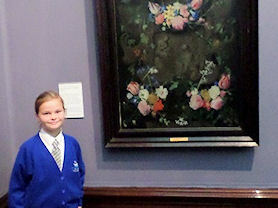 Discovering beautiful art work in Birmingham Museum and Art Gallery. 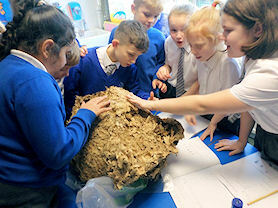 A wasps nest – another opportunity to learn ‘hands-on’. 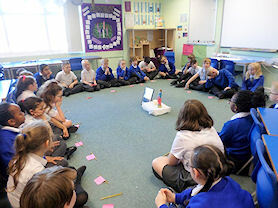 Sharing prayer and reflection time. Having fun dressing up at the Birmingham Museum and Art Gallery. 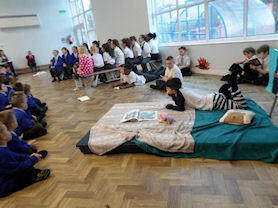 ‘The Christmas Truce’ performance as part of their Remembrance assembly. We love opportunities for practical learning.